According to recent indications, the mobile market, with all its growth spurts, is set to explode and become the primary way we interact, shop and bank. Google’s Wallet and Apple’s Passbook are the tip of the iceberg in reaching consumers on their smart phones. Going by the emerging trends in recent months, your cars, your appliances and even your eyeglasses are about to become tools for marketers to reach their targets. Technology is on the horizon which uses your smart phone to tag your location, and then alert marketers who have subscribed to the technology. They will then send you information on the nearest malls, theaters and restaurants, depending on your history and usage. This is called Near Field Communication (NFC) and it helps both the consumer and the marketer. Another way retailers are targeting their market segment using smart phones is by offering apps like ShopSavvy, to help with price comparison and other factors involved in the decision to buy. The smart phone, which was the ‘third space’ after the brick-and-mortar shop and the Internet until recently, is evolving to become the primary way the younger, connected generation shops. Many markets around the world are working with banks to offer banking services on their mobiles; not just smart phones, but even low-cost mobiles. In countries like Somalia and Turkey, where roughly 35-45% of the population has access to banks, more than 65% use cell phones. This fact has made these markets ideal to test mobile banking for the coming years. This pilot project, which has taken mobile banking to the next level, has been immensely successful and it looks likely to dominate the banking sector around the world. A lot of car manufacturers including Ford, GM and Toyota are incorporating new-age communication tools like Wi-Fi and 3G or 4G connectivity, making it, as one car company spokesperson put it, ‘the original and ultimate mobile device’. When the car becomes a ‘friend’, using his mobile, the car owner can get tweet-like alerts when the car is low on fuel, have wheels that are misaligned or anyone attempts illegal entry. Audi A3 is being dubbed the ‘world’s largest smart phone’ and offers everything your smart phone can offer, in a larger and easy-to-use model. Car manufacturers are working to include your car into your wireless plan. 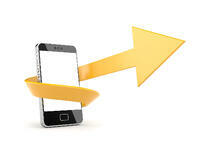 Your appliances being synced with your mobile phone is the next step in consumer convenience. Major appliances are now set to communicate with the customer’s smart phones and other equipment from the minute they are unwrapped. Your refrigerator will let you know when you are running low on milk or eggs. The FourSquare trial has been immensely successful in the US and Europe. This only means that in future, your credit cards and your smart phones will manage every aspect of your spending from travel, shopping, entertainment and even banking and personal finance. Industry experts predict that another one billion new mobile connections will come into existence by the year 2020. Out of these billion new connections, at least 50% are likely to use their phones for banking purposes. The younger generation is more likely to use mobile for accessing Internet than their PCs, and they don’t think twice about ordering from their phones, making the PCs redundant. Smart phones are also in danger of losing their screens. Products like The Pebble, the Cookoo and the G-Shock Bluetooth are pioneers in Bluetooth watches that allow the smart phone user to utilize their phone from their wrist unit and not actually touch the screen. This gives them both hands free ability and also the convenience of leaving the phone on the desk while operating it from the watch. Other major smart phone companies like Google, Apple and Samsung are said to be working on similar Bluetooth enabled watches, which will help to access smart phones.